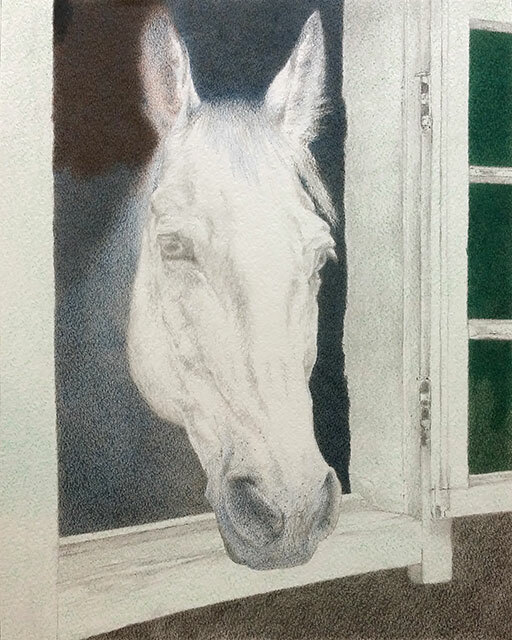 Decided to make progress with the horse first and with the window frame later. 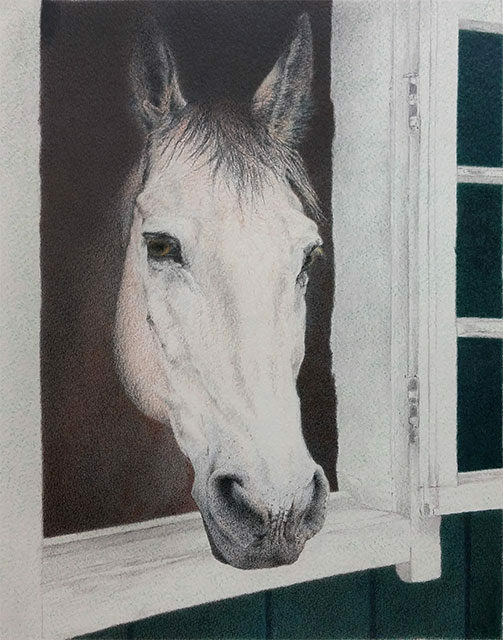 Both are going to differ a bit from my reference, and because the horse is more important I am going to figure out where his colors end before touching the window. I am now debating between natural wood and old paint that would compliment the horse. So it was a good idea to use graphite first, then continue with color on top of it. Maybe a softer grade like H6 would be more efficient, especially on a textured paper like this one. The disorganized colors that are already there are from different kinds of strokes I tried to see what works better. 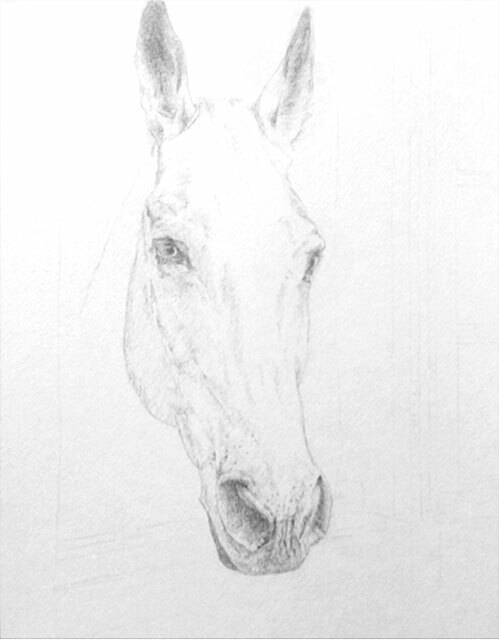 Back to the unfortunate horse who is now ready for color! I am done with the graphite underdrawing (if this is not a word it should be) and securing it with a workable fixative. Let’s see if that speeds up adding darks with colored pencils. Rainy shooting conditions made it look like there are at least two different tones of graphite, but in reality it’s the same tone. I don’t think I have ever been this excited to see a rough drawing of a horse head finally appearing on a piece of paper as planned. There were at least two iterations that were not to my liking at all, but finally everything is where it should be, the sketch is transferred to the final watercolor paper (it’s a Strathmore one with nice slightly uneven surface), and I can move on to preliminary shading with graphite. The horse is picking out of a barn door window, but it is barely visible right now. I need to decide whether to keep it white like in the reference photo or make it natural wood. The horse is going to be light chestnut with a lot of color nuances in the face, and even weathered white seems to be too stark next to all that, so most likely I will use some kind of amber or light wood for the window.